While looking through some old notebooks I had brought with me on trips to India, I found this sweet story that Sam Kerawala (Eruch's cousin, known for his skillful storytelling) told at the Samadhi. A small circus that toured villages had among its few animals an elephant who had been trained to garland any person who sat in a particular chair. They would seat the headman of the village in that chair, and at the beginning of the show the elephant would go and garland him. The intention was to flatter the headman so that he would be agreeable to having the circus perform. 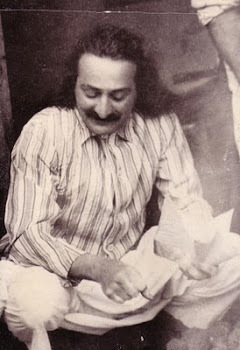 On one particular occasion, Meher Baba happened to be in the audience. As the show started, the elephant came forward with its garland, but instead of going to the special chair that the headman was sitting in, as it was trained to do, all on its own the elephant went directly to Baba and garlanded him! I loved the story of the elephant. I was in India in '76 but before I went, I had told everyone in England that I wanted to see an elephant. When we got there we were met by by Baba's brother Jal and he took us to the zoo in Poona. 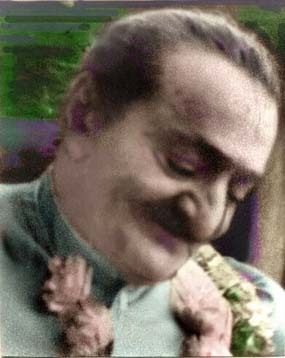 Sure enough there was an elephant, but not just any old elephant. Somehow Jal had access to the elephant's cage and in we went. Jal said her name was Sumitra and that Baba had taught her a few tricks. Jal told me to drop a coin and sure enough Sumitra picked it up with her trunk and handed it back to me. Sumitra allowed me to hug her trunk and kept 'sniffing'? my feet. One of a many memorable memories. Just found this lovely bit of interactive what-not! It's great. I have been thinking of spreading Baba's words by way of a message in a bottle, thrown into my local river which runs quite fast eventually reaching London and the Thames. Any suggestions for 'messages'?